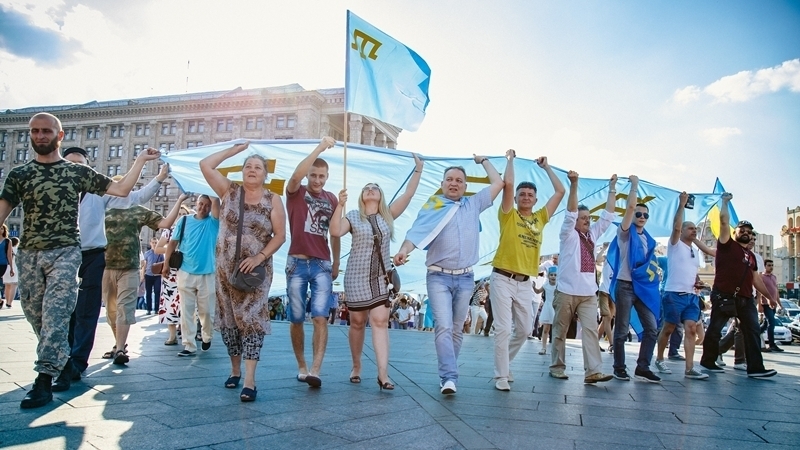 In the settlements near the administrative border with the occupied Crimea events will be held on the Day of the Crimean Tatar flag on June 26, the Chairman of the board of the Crimean Tatar resource center Eskender Bariev announced today, June 25, at a press conference in Kyiv. “In the Crimea, in Ukraine and around the world, for more than one year similar events are held to celebrate the Day of the Crimean Tatar flag. The Genichesky district will host the events as well. At 9:30 an auto column will be formed, which will leave to the center of the village of Novooleksiivka. The gathering of cars will be near Stella Makharadze. We urge residents and guests of Genichesk and Novooleksiivka to join the rally to demonstrate solidarity with the Crimean Tatars," Bariev said. At 10:00, the procession with flags will begin from the cafe "Druzhba" to the Novooleksiivsky house of culture, where a concert of patriotic song will be held and performances on the national wrestling of kuresh and martial arts will take place. To the day of the Crimean Tatar flag, the Ministry of Information Policy of Ukraine issued a social advertisement that emphasizes the importance of the Crimean Tatar flag as a symbol. Reportedly, a bike ride will take place in Kherson on the Day of the Crimean Tatar flag. In Kyiv, an auto rally and a procession to the Independence Square are planned. After that, a rally is to be held in the center of the capital.